Xolo Black which was the latest smartphone released in the price range of Xiomi Mi 4i is even competitive in the features aspect as well. There are some slight differences between the two firstly the Xolo Black comes with a 5.5 inch 1080p display compared to the 5 inch display of the Xiaomi Mi 4i. Another major difference is the camera with the Xolo Black having Dual camera setup compared to the single camera in the Xiaomi Mi 4i. 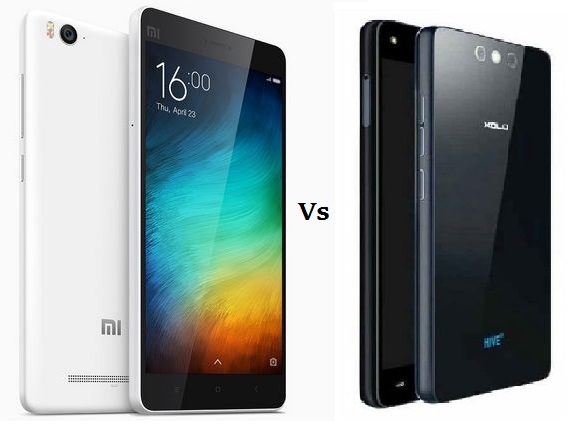 So let us see the comparisons between equally placed Xolo Black vs Xiaomi Mi 4i in a table form. In the display segment the Xolo Black comes with a 5.5 inch Full HD display having 1080p resolution compared to the 5 inch Full HD display of the Mi 4i and both the devices come with OGS display. Both the Xolo Black and Xiaomi Mi 4i are equally placed with similar 64-bit 1.7 GHz Snapdragon 615 Octa-core processor having Adreno 405 GPU and 2GB of RAM. This is the major difference which will separate both the devices apart from the bigger sized display. The Xolo Black comes with Dual Rear camera set up which is a 13MP + 2MP cameras having LED Flash as the Primary camera and a 5MP front facing camera. The Xiaomi Mi 4i comes with a 13MP rear and 5MP front facing camera. The dual camera in Xolo black gives it faster focusing power and also to get multiple focusing and some effects like the Bokeh effect. Which surely gives it an upper hand compared to the Xiaomi Mi 4i. Bothe the Xolo Black and Xiaomi Mi 4i run on android Lollipop 5.0 but the Xolo Black comes with its Hive UI and also Mi 4i runs on MIUI 6. Both the OS have their own plus and minus and it will be up to the user as some might like it and some don’t. Both devices come with 16GB of internal memory. The Xolo Black has an upper hand in this segment with expandable memory option with the help of MicroSD card support compared to the absence of memory card option in the Xiaomi Mi 4i. The Xolo Black has some advantages compared to the Xiaomi Mi 4i as it has the Camera advantage and also with expandable memory along with the 5.5 inch display of the Xolo Black compared to the 5 inch display of the Mi 4i. And another important factor is that the Xolo Black is available for purchase all the time without Flash sales giving it all time availability unlike the Xiaomi Mi 4i which comes in Flash sales. I am in market for a sub-15000 phone and I think I’ll buy XOLO Black because it looks stunning. Thanks for this comparison. It is truly an amzing phones Priyansh loved using it and it is going to take on the competition really well. Go for it without any second thought. I am given to understand that there is an issue with regard to Play store, where it shows an error and purchasers are not able to use it ? Did you face any such problem ?